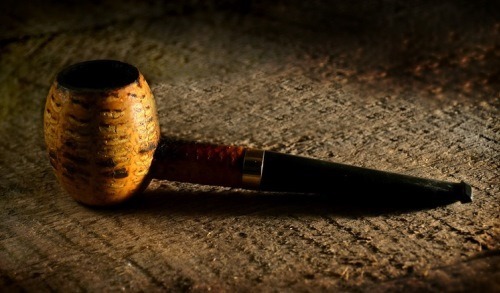 First, I’d like to apologize for the lack of pipe content in the last couple weeks (you may recall my previous articles on why I smoke a pipe, tools of the trade, beginner pipe blends, and how to properly pack a pipe). I have been in a swamp of finals and term papers finishing up my first semester at graduate school, and I just have had no time to write anything about pipes, much less to smoke any. But, the semester is over, summer is here, and I’m back to smoking! So today we will talk about building cake in a pipe. So, first off, what is cake? Cake is the term for the carbon build-up left in a pipe after you smoke a bowl of tobacco. Cake is a good thing. You want a nice, even cake lining the bowl of your pipe. This will help keep the smoke cool, and it will also lend a particular flavor to your smoking, depending on what types of tobacco you’ve built that cake with. A very important thing to remember from this definition is that we want cake to be even. If your pipe’s cake gets too thick, you can crack the pipe and permanently break it. So, anytime you think it might be getting too thick, take the scraping part of your pipe tool and just break it down. Exactly how much cake one wants is up to debate, but the general rule I’ve heard is about the thickness of a dime. How does one build cake? There are a lot of tricks. Some will tell you to fill your pipe with honey or jelly so that the ash will stick to it, others will recommend plugging the pipe somehow, etc. All of these tricks have one thing in common: They are unproven, and risky. The only way to reliably build cake is to smoke your pipe, evenly, to the bottom of the bowl. The method I use to break in a pipe takes quite a long time, but it’s a great way to do so, and it ensures you get a consistently even cake. All you’re going to do is pack about a quarter of your pipe and smoke it, all the way to the bottom of the bowl. If you cannot finish all the tobacco in one sitting, just place the pipe down and come back to it. After you’ve done maybe six or eight bowls at a quarter full, bump it up to a half bowl, and, again, smoke six or eight bowls. If you keep doing this, afterwards jumping to 3/4 of a bowl and then finally full bowls, you’ll experience a cool, sweet, broken-in pipe. If you have any questions about how to build cake, if you have any tobaccos that you think perform particularly well for cake-building (I prefer a burly blend like Prince Albert), or if you have any other experiences or stories about breaking in a pipe, let me know. Your series has inspired me to mix in a pipe every once in a while and it had been a few years since I did that. So maybe this is an obvious question but how/why does cake keep the smoke cooler? I get how it can impact flavor, but it's not obvious to me why it would impact combustion temp or cool the smoke after it is produced. Amazing! Your post i so much valuable and great. I like your post very much. Thank you for your great share. If I remember correctly, most of the temperature decrease comes from extra matter to absorb the heat of the flame. Instead of the your hand holding a wooden bowl with burning tobacco in it, you're holding an insulated bowl, the carbon is providing more distance between your flesh and the fire, and just another agent the heat has to transfer through.